Today was all about learning how to create apps using MIT App Inventor which is "an intuitive, visual programming environment that allows everyone – even children – to build fully functional apps for smartphones and tablets." MIT App Inventor uses block based tools to create simple to complex apps in an accessible and powerful way. Our project for the day involved a few new things to learn. 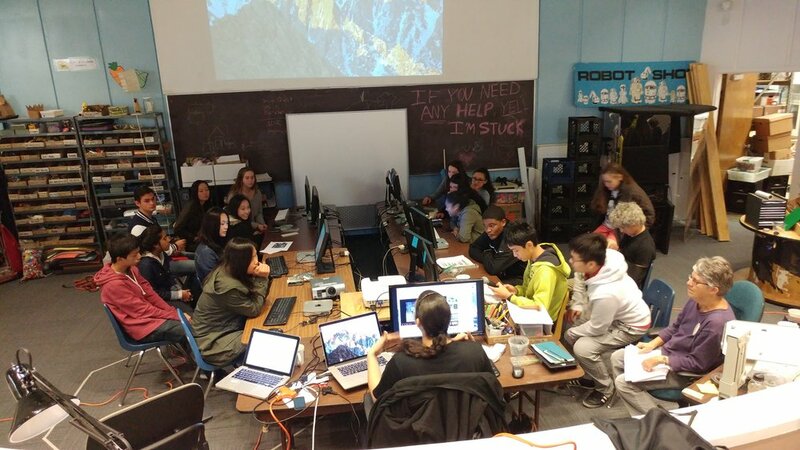 Since they were exposed to the basics of programming with arduino last week, they expanded upon this knowledge with the integration of a bluetooth receiver which added a new dimension of connectivity to their projects. In addition, they needed to use MIT App Inventor to create an app that connected to the bluetooth module that implemented a user interface to be able to turn an LED on and off with the click of a button. While the app seemed simple enough on the outside, this project involved a lot of complex mechanics both within the digital tools and physical tools they were using. Afterwards, the interns worked on their Design Sprints for their apps in order to add fun elements, such as pictures, colors, videos, and more. One of the important aspects of developing apps is that our interns have to think about the user interface design that makes their product friendly and easy to use for their intended audience. The way a child would engage with a digital interface differs from how their parent would use the same interface. Since we are at the Lawrence Hall of Science, our interns needed to keep in mind what appeals to an intergenerational audience. This will be an integral part of their final project which we will be presenting ON DAY 6! Newer PostTechHive Fall 2017: Day 6 // The AR Box Experience!